Leading up to the eventual release of PathFinder 7, we’ll be highlighting and talking about some of the biggest a newest features slated for PathFinder 7. Most of the ideas for these features came directly from our users, and the vote count on our feedback page for each idea held significant weight in our decisions. In short- You spoke, we listened. 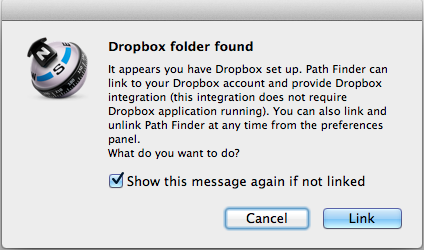 For the first installation of the series, we’ll be talking about Dropbox integration within PathFinder. As one of the longest and most requested features, Dropbox and PathFinder will finally be able to work together harmoniously. Once you are successfully linked, you will able to manage your Dropbox files the same was as in the Finder or the Dropbox application itself. Complete and detailed instructions for linking your Dropbox account to PF and how Dropbox works with PF will be available upon PF7’s release. Stay tuned for the next exciting PathFinder 7 feature! PATCH: Another patch released, 6.5.3.